Fracture Mechanics is that technology concerned with the modeling of cracking phenomena. Bulk (smooth specimen) properties are not normally useful in design for determining a material’s tolerance to cracks or crack-like defects, because material tolerance to flaws resides in a material’s ability to deform locally. Since the source of fractures can be identified with the lack of material tolerance to cracks, it seems only natural that attention should be focused on the crack tip region where the material must resist crack extension. This section will introduce the principal features of a mechanical model that characterizes a crack movement in structural components fabricated from materials having low tolerance to flaws. Some basic information that a designer should be familiar with prior to the utilization of remaining sections of this handbook is presented. This subsection will define the meaning and use of the fracture mechanics model for the control of fracture and sub-critical crack growth processes. The application of a fracture mechanics model to solve crack problems came about through the following realization: component fractures that result from the extension of small crack-like defects are failures that depend on localized phenomena. Consider the three independent modes of crack extension that are illustrated in Figure 2.2.1. The tensile opening mode, Mode 1, represents the principal action observed and this is the type of separation that we design against. While fractures induced by shear stresses can occur, these fractures are rather infrequent. There are hypotheses available for describing the combined influence of two (or three) modes of crack extension but these will not be discussed until Section 4. 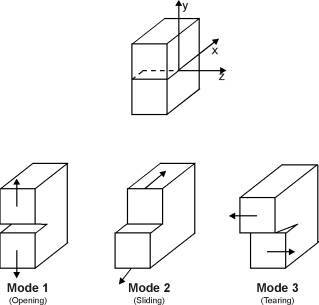 In general, since improvement of a material’s Mode 1 fracture resistance will also improve the resistance to the combined mode action, the development of concepts throughout the Handbook will emphasize Mode 1 crack extension behavior. A linear elastic analysis of a cracked body provides a good first approximation to the localized stress state in materials that fracture at gross section stresses below the yield strength. No additional refinements in the analysis are necessary if the gross section stresses at failure are below 0.7sys. The elastic analysis when modified to account for restricted amounts of stress relaxation due to crack tip plastic deformation provides an adequate description of fracture that occurs above 0.7sys.